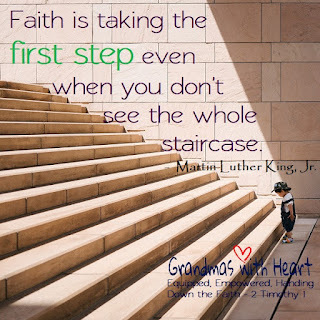 grandma's cookie jar: Faith = Taking the First Step! What are you facing right now in your life? Do you have a concern with your grandchildren and/or son/daughter/their spouses? Are you facing health concerns? Money concerns? Any concerns? Take those concerns to Jesus - if you care about these things, so does He! Put your faith in Him, even if - and especially if you do not see how these concerns will be resolved. And, remember how Jesus answers your prayers, so you are able to share it with your grandchildren. It is inevitable at some point in their lives they will face the same or similar concerns. 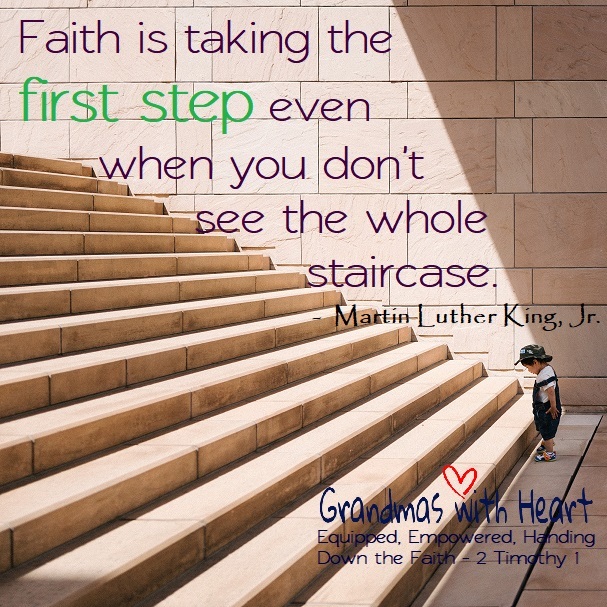 If they remember how Jesus helped you, it will encourage them to put their faith in Jesus - even when they are not able to "see the whole staircase"!